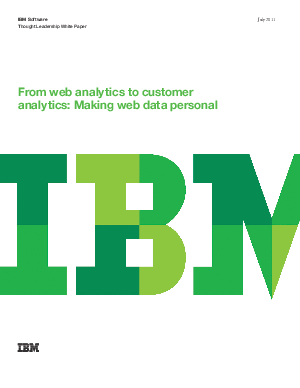 Conventionally, marketers use web analytics at an aggregate level. They seek to report on the performance of their web sites and online advertising, so they can adjust their efforts to improve the results. This is an extremely worthwhile application that can deliver excellent return on investment. However, marketers may be squandering a huge opportunity if they do not also leverage web analytics as a rich source of behavioral insights on individual prospects and customers. Used this way, web analytics can play a far more direct role in engaging customers, improving customer experiences, and increasing sales, by enabling companies to deeply personalize their communications and interactions.